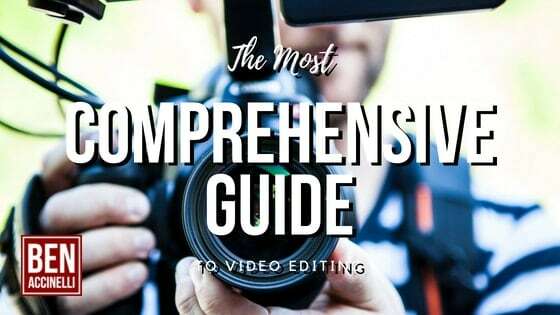 Have you been looking for an all-in-one video course on video editing? I’ve been filming and editing videos for over five years and I’ve been able to put together a comprehensive video series on how I edit video. Keep in mind that these videos don’t show 100% of what I do, but I’ve managed to put together my thoughts in video form to explain the basics of my video editing. This is the foundation I use with every video I edit. I hesitate to share “my secrets” if you will, but I feel that I’ve been given a skill set provided by my career over the years that it feels right to provide even one person the resources for them to excel. Now I’m not proclaiming to be an expert, but I do know what works efficiently and what my clients have liked of my work in the past. Please leave your feedback or drop me a line on your thoughts. Any feedback is greatly appreciated. If you’re not organized in your video projects, you will lose time because of a lack of an efficient file structure. I’ve used this file structure method for years and it has saved me a lot of time and energy with all projects I work on. Prepping your audio files will save your project and your own tail if you ever get your files corrupted. You only have one chance at editing your audio file and you don’t want to ruin it. Create an immediate backup that gives you virtually an infinite amount of recovery files. Internal project file structure is just as important as your project’s file structure. This will make in-project navigation super easy to use and if you’re passing projects to other editors, it will be easy to pick up where you left off in the middle of a project. This sequence lays out all files into the sequence to create a reference point for all video and audio files. It will allow you to quickly scrub through any b roll footage you have, too. A video isn’t a good video unless it has good audio. Video picture quality can suffer, but without clear and crisp audio, the entire video is ruined. You can apply this method with just about any audio source. The beauty in this method is that you don’t need expensive gear. I’m not saying that gear won’t help, but you can save your monies if you apply this audio method. Here, you’ll clean up the fluff and identify the best takes for your video. The purpose here is to create a backup of your best clips that you’ll be using in your Main sequence. Forgoing this step may cause hours or days of lost work. I’ve learned the hard way that you don’t want to repeat this step again if something were to happen down the line in your project scope. This is where you’ll be crafting the narrative of your video project. Any clips you don’t use, you’ll put at the back of the line to potentially use them again throughout the video. Try and keep this as clean as you can—avoid using too many timelines. When you’re done and the project is finalized, do your best to consolidate your timelines as much as possible. Using the Final sequence to export will save you time and clean up your project workflow. It will allow you to quicly and cleanly make watermark and branding updates to your videos to give them the polished look and feel. Once your project is finalized, you’ll be able to export with the highest quality for your clients. Frame is a must-have platform for video editors, editing teams, or collaborating with your clients. Uploading is a breeze and even the free service allow you to improve your editing workflow. Frame.io integrates with Adobe Premiere and After Effects as well as Final Cut Pro. Once feedback is placed in Frame, you can import the comments at the corresponding timestamp in Premiere. Frame.io is a necessary tool if your work with a team of editors, collaborate with clients, or need something to review and annotate feedback in your videos. Using frame in your business is a must if you gather feedback on your videos.